Experience luxurious five star camps in Botswana during the special Fly Me Around Botswana safari season. This tour begins with two nights at Victoria Falls with a sunset cruise and guided tour before heading to Botswana for seven nights of game drives, walks and boating safaris at some truly magnificent camps in the Chobe National Park and two regions of the world-renowned Okavango Delta. You are met on arrival at the airport after clearing customs. 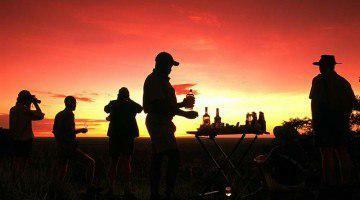 You will be transferred to the the luxurious Vic Falls Safari Club. Enjoy a leisurely sunset cruise on the tranquil waters above the Falls, where canapés and sundowners are served, whilst you enjoy the sights and sounds of the Zambezi River and marvel at the beauty of an African sunset this evening. After breakfast you will be transferred across the border to &Beyond Chobe Under Canvas where you will be spending the next three nights. Chobe Under Canvas reaches far beyond the bounds of the traditional Botswana safari – this mobile-tented camp, situated in remote and beautiful corners of Botswana, offers guests a safari of a lifetime. Chobe Under Canvas has just five luxurious comfortable and spacious mobile tents with ensuite bathrooms. Enjoy two days of twice daily safari activities including boat cruises on the Chobe River and game drives. This morning after a morning game drive and breakfast you will be transferred to Kasane for your light aircraft flight to the Okavango Delta. The short flight is a highlight in itself as you fly over one of the world’s most amazing ecosystems and spot wildlife from the air. Upon arrival at the Nxabega Airstrip. On arrival you will be transferred to &Beyond Nxabega Safari Camp, comprising of 9 luxury safari tents with ensuite facilities and private decks facing out over expansive lagoons and channels. Burnished teak floors and a lofty roof frame the sitting and dining areas. Private bush dinners, lamplit cocktails on a river island or a walking safari with al fresco picnic are provided with pleasure by Nxabega’s warm and friendly staff. Nxabega has just completed a grand refurbishment which has placed among the portfolio&apos;s top properties. 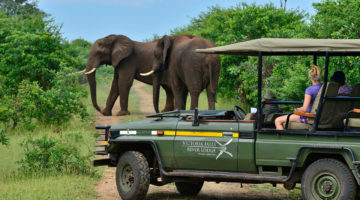 Enjoy three days of twice daily safari activities including game drives, boating or mekoro excursions. This morning after a last game drive and breakfast you will be transferred to the airstrip for your flight to the Chitabe airstrip, where you will be met and transferred to &Beyond Sandibe Okavango Safari Lodge. 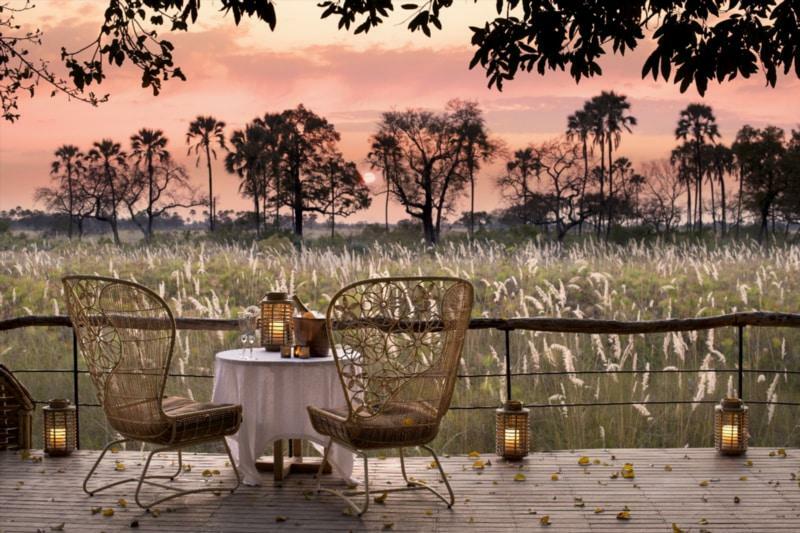 &Beyond Sandibe Okavango Safari Lodge is situated on a permanent channel of the Okavango Delta, adjacent to Moremi Game Reserve. With exclusive traversing rights over 270 km2 of wilderness in a private concession, this site was specifically chosen for its extraordinary beauty and proximity to the game-rich grassy plains. &Beyond Sandibe Okavango Safari Lodge has 8 luxury thatched suites in an African-inspired cottage with ensuite bathroom with outdoor shower and private plunge pools. Drawing their inspiration directly from nature, the suites at &Beyond Sandibe are being elevated above their surroundings, gazing out onto the Delta. Uncluttered and elegant, the lodge will feature a copper palette, with natural rusty tones. Copper-clad mekoro, sculpted wooden tables and intricate baskets will celebrate the very best of Botswana craft. At night, the rooms will become private cocoons, with fireplaces providing warmth and light in winter. Enjoy two days of twice daily game drives. 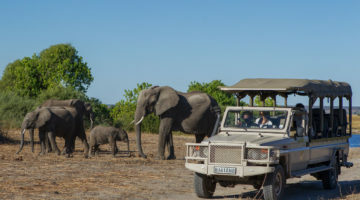 This morning after a morning game drive and breakfast you will be transferred to the airstrip for your flight to Maun to connect onwards. Local brand alcoholic drinks and laundry at Chobe Under Canvas, Nxabega & Sandibe. Tour of the Falls & Sunset Cruise. 4 kms from Victoria Falls and situated within the magnificent grounds of the Victoria Falls Safari Lodge resort and overlooking a private waterhole, is the brand new luxury club. The Club comprises 16 Club Rooms & 4 Club Suites. The luxurious rooms have uninterrupted views of the unspoit bushveld, spectacular sunsets and the waterhole. All beds are three quarter beds, that can be converted into king beds. There are 2 sets of interleading Club Rooms and 2 sets of Chub Suites interleading into Club Rooms. Room facilities include: mini bars, digital safes large enough to hold laptop computers, international multi sockets, beverage station including expresso machine, LED lighting, sliding glass doors and gauze screens to balcony, complimentary WiFi and air-conditioning. The Suites offer the same as the Club Rooms but include a spacious adjacent sitting room. The Safari Club has its own Club Lounge with: separate welcome zone, butler service, complimentary afternoon tea and pastries served 15h30 to 16h30, complimentary cocktails served from 17h00 to 18h00, complimentary shuttle service to the Victoria Falls and places of interest in Victoria Falls and the Boma Restaurant, light meals are available 11h00 to 14h30 (own cost) & bar service from 11h00 to late (own cost). All Safari Club Residents have access to all existing facilities at the Victoria Falls Safari Lodge resort, but not the other way around. The four superior suites offer the same facilities as our club rooms but also include a spacious adjacent sitting room, making them incredibly spacious and comfortable There are 2 sets of inter-leading Club Rooms and 2 sets of Club Suites inter-leading into Club rooms. Club Suites offer the same facilities as the Club Rooms but include a spacious adjacent sitting room. There are 2 sets of inter-leading Club Rooms and 2 sets of Club Suites inter-leading into Club rooms. Spacious, comfortable mobile safari tents, each with twin or double bed, ensuite bathroom, seperate wc and alfresco bucket shower, with hot water delivered on request.